Well… who knew? I was just at Barnes and Noble and saw an issue of The Drake. I don’t have a subscription and while I have heard really good things about the magazine, I had not ever purchased one. I had decided that this was the time to do so and as I thumbed through the magazine on the way up to the cashier I saw there was a poster insert. I took a peak and recognized, instantly, my own hand. Well… that’s kind of awesome. 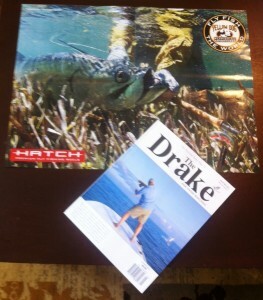 My tarpon is in The Drake. Jim Klug took the photo, and a damn fine photo it is. This entry was posted on Saturday, June 23rd, 2012 at 12:10 pm	and is filed under All the other stuff. You can follow any comments to this entry through the RSS 2.0 feed. You can leave a comment, or trackback from your own site. So now you are more famous than you were before. Just my hands are big shots now. Can’t take them anywhere without them getting noticed. Rumors of my hands being seen with one of the Kardashians are false. What’s funny is that I get the Drake. I looked at the poster. I thought, “hmmm, that looks like one of Bjorn’s photos from Cuba,… nahh”. I’m looking for hand insurance now… no one wants to take on the risk at this point. They are simply too valuable. We should call this the “Bjorn Ultimatum” …… 🙂 Hand insurance or no more shots! Seems like my 15 nano-seconds of fame might be up. My hands are back to pounding keys at work today, as if nothing happened. Dude, my boy has it hanging in his room. That’s quality. Awesome Matt. Jim is a fantastic photographer. He got it right.